French composer (born in Florence). The son of a miller, he was probably entrusted to the care of a local court after the death of his mother, and was taken to France by the Chevalier de Guise in March 1646 to serve as garçon de chambre and Italian conversationist in the household of Mlle. de Montpensier. At some point he was tutored in guitar and violin as well as dance; the March 1687 edition of Mercure de France lauds his skill as a violinist, also quoting him as having learned by age 17 everything about music he was ever to know. He studied keyboard with Gigault and Roberday, and cultivated a relationship with Michel Lambert, a highly sought-after singer and air de cour composer who served Lully's patron among other nobles and whose daughter Lully later married. Perhaps partly as a result of Lambert's guidance, Lully quickly gained prestige at court. Mlle. de Montpensier released him from his post in October 1652, after her exile for her participation in the Frondes. He danced several roles in the Ballet de la nuit on February 23, 1653 and succeeded Lazarini as composer of the king's instrumental music a month later. From 1652 he was active at court as a dancer and composer and from 1657 onward was responsible for most of the ballets de cour, with the poet Benserade as chief collaborator. Around this time he also took control of the 16-member "petits violons," who played for the king's meals and traveled in his entourage; contrary to general belief, the group evidently predated Lully's leadership, under which they first performed in La galanterie du temps in 1656. Cardinal Mazarin died on March 6. 1661, and Louis XIV took de facto power. On May 16 the king named Lully surintendant de musique et compositeur de la musique de chambre; he became a naturalized French citizen in December of that year. In July 1662 he was appointed maitre de la musique de la famille royale and married Madeleine Lambert, with the king and other high officials attending the service. He composed entrées for a revival of Corneille's Oedipe in 1664 and between 1664 and 1671 worked with Molière on machine plays and comédies-ballets, including Le mariage forcé (1664), Le sicilen (1667), and Le bourgeois gentilhomme (1670). 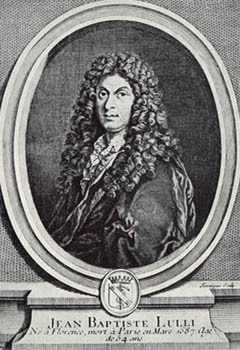 Lully's contributions to Molière's works included dances, vocal music, and entire scene complexes, musical structures of the type that he would later use in his tragédies lyriques. Lully soon gained the sole privilege of presenting operas. In 1669 Pierre Perrin succeeded in getting permission to form an Académie de poesie et de musique. His production of Pomone in 1671 was a success, but he was subsequently jailed for debt. 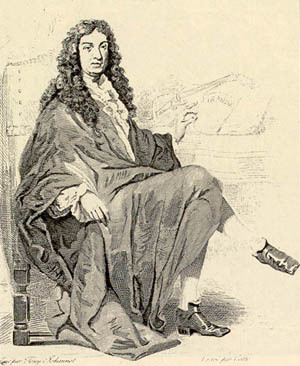 While in jail, Perrin promised the rights to various people involved in the undertaking; Lully intervened, pledging to pay off Perrin's debts and grant him a pension in exchange for the privilege. Perrin agreed, and despite legal action brought by the disenfranchised partners, Lully prevailed, forming the Académie royale de musique in March 1672. Other restrictive patents followed, until by April 1673 any production not affiliated with the Académie royale was limited to two singers and six players. Lully then embarked on the production of tragédies lyriques, in collaboration with the librettist Quinault and, initially, the machinist Vigarini.The Académie royale took over the Palais Royal Theater after Molière's death in 1673. A cabal attempted to dislodge Quinault in 1674, and the poet was banished from 1677 until 1680 for an ungracious portrayal of the king's mistress, Mme. de Montespan, in Isis (1677); still, Lully considered Quinault the "only poet with whom he could work" ( Mercure galant, March 1687). Lully himself was the target both of attacks by La Fontaine and Boileau and of criticism in the Mercure galant and was involved in legal proceedings in 1675-77 over an alleged murder conspiracy led by Guichard. His position at court never waned, however; the king became godfather of his eldest son in a ceremony in September 1677, the stage works after 1678 were granted royal privilege to be printed, and Lully gained the extremely powerful post of secrétaire du Roi in 1681. Louis XIV became ill in late 1686; to mark his recovery, Lully on January 6, 1687 led a performance of his Te Deum, during which he struck his foot with the large conducting stick. He refused to have his toe amputated; eventually fatal gangrene set in, but before his death he took care to arrange the details of his huge estate. Lully's pupils included Pelham Humfrey, Georg Muffat, J. S. Kusser, and J. K. F. Fischer, who carried the French orchestral style to England, Germany, and the rest of Europe.